Recreational fishermen put their boat on the trailer at the Mills Norrie State Park. Boat launch stewards work with recreational boaters like these to encourage AIS spread prevention best practices. Credit (for all photos): Ryan Strother / NYSG. Dutchess County, NY, July 2, 2018 - Just before Memorial Day weekend, Brittney Rogers, NYSG’s Extension Aide and Nordica Holochuck, NYSG’s Hudson Estuary Specialist teamed up to complete a three-day training for the next round of 2018 watercraft inspection stewards. At the event, watercraft inspection steward programs were provided with standardized training with local concentration and expertise. The stewardship training follows the national standards of Clean Drain Dry, and the Stop Aquatic Hitchhikers campaigns. The watercraft inspection stewards are placed at boat launches and inspect recreational equipment. Stewards encourage recreational boaters to clean, drain and dry their watercraft before and after launching into waterbodies. They conduct non-regulatory inspections with the consent of boat owners and serve as educators to the public on watercraft inspection, and invasive species. Stewards then collect data and report it to standardized databases for research purposes. The stewards at this regional training will be stationed this season in the Lower Hudson River area, though there are nearly 200 stewards placed at waterbodies throughout New York State. “Recreational boating has been identified as a key pathway in aquatic invasive species spread. Prevention is the most cost-effective way to manage AIS. Prevention programs like the watercraft inspection stewards prevents ecological problems and saves public money in the long run by avoiding costly management techniques necessary after a new invasive species population is established,” said Rogers. (At Left) During the training, NYSG's Brittney Rogers (at far right) observes as stewards improve their understanding of boats, its parts and various aspects the boating experience; (At Right) NYSG's Nordica Holochuck (in white) played the part of "recreational boater" during practice boat launch steward inspections. In July 2017, two AIS stewards stationed at Upper Saranac Lake inspected personal watercrafts with viable hydrilla plants—an aggressive aquatic invasive species. The stewards were able to intercept the hydrilla, confirm the identity of the plants, and work with the watercraft owners to de-contaminate their watercrafts. The work of the stewards prevented the Upper Saranac lake from potentially establishing a population of hydrilla plants. During the first training session, Frank Boger and Kathy Boger, representing the New York State Office of Parks, led all stewards through the NYS Boating Safety Course and Certification process. Stewards are often the first professionals that boaters interact with, so knowing boater safety information is important as they are on the “front lines” of recreational water use and can share information with the public. Boat launch stewards practice non-regulatory inspections and educating the public on invasive species spread prevention. Participants also became experts of boating safety standards and safety gear requirements. Stewards in training have the opportunity to improve their understanding of boats: learning the different parts of boats and various aspects the boating experience. Stewards learned safety gear requirements, information about different types of boats, and completed the NYS certification that personal watercraft operators are required to complete. Chris Doyle and Emily Mayer, from Solitude Lake Management, led the stewards through an aquatic invasive species (AIS) identification course. Cathy McGlynn, from the NYS Department of Environmental Conservation, gave a presentation titled “Hydrilla; The need to know.” John Helmeyer, of the NYS ENCON Police, presented on the role of the NYS Environmental Conservation department. Leah Gorman, Capital Mohawk PRISM’s Aquatic Invasive Species Coordinator, gave a presentation on iMapInvasives: an online GIS-based data management system that assists citizen scientists and natural resources professionals working to protect natural resources form the threat of invasive species. Stewards were trained to use the mobile app to document and report invasive species observations. Members of the public are also able to create an iMapInvaisves account and share invasive species sightings. Holochuck walked the stewards through the importance of the Hudson River. 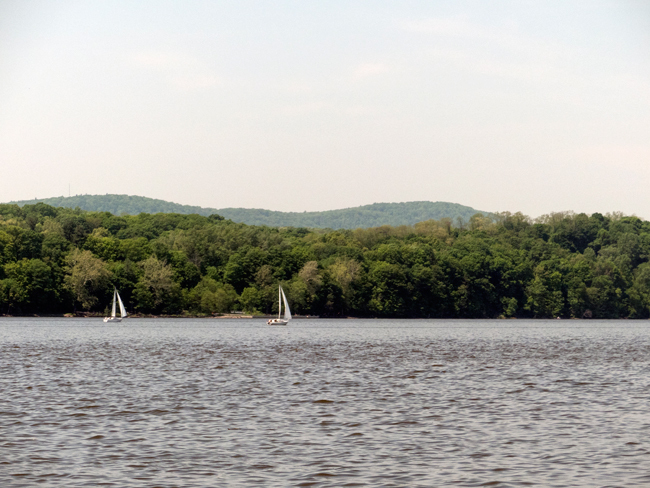 The stewards will be stationed around the Hudson River, so they were given a background on the ecological and cultural importance of the river to share with boaters. Stewards then had the opportunity to walk along the Hudson and model the iMapInvasives training. The final day of the session focused on proper data collection, as well as practice opportunities for conducting inspections in the field. 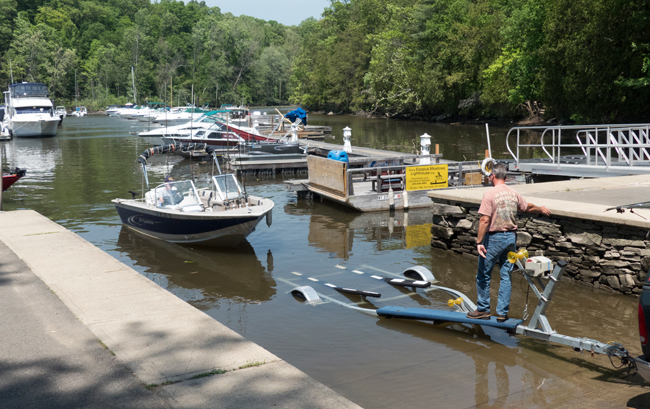 In addition to courteous and effective boat inspections, standardized data collection is important to New York State because it allows information from each boat launch to be complied in a standard database. Rogers led the stewards through the Introduction to Watercraft Inspection and Safety session. Samantha Epstein, representing Hudson River Sloop Clearwater, educated stewards on outreach, education and basic biology translations. Her talk included information on how to interact the public, including best practices like using common names for species, knowing how to describe various aquatic plants, and communicating stewardship practices. One of the important roles for watercraft inspection stewards is data collection. Information taken during voluntary inspections surveys include: if invasive species were found, boater stewardship practices, and the previous waterbody the craft visited, among others. Information from stewards is compiled into a standardized data set, where program coordinators can review the data, which provides a better analysis of NYS’s AIS prevention efforts. (At Left) John Marino, NY Natural Heritage Program, presented the standardized data collection tools stewards will use to record data and report it to standardized databases for research purposes; (At Right) Brittney Rodgers, NYSG's Extension Aide, introduced watercraft inspection stewards to the diverse recreational opportunities that attract NY's boaters to the water. John Marino of the NY Natural Heritage Program presented on the data collection tool, Survey 123 referred to as WISPA (Watercraft Inspection Steward Program App.). Marino taught stewards how to adhere to standards and protocol while using the WISPA data collection interface. This database, piloted in 2017, is currently managed by the NY iMapInvasives team, coordinated by NY Natural Heritage Program and NYS Department of Environmental Conservation. Public participation rates for voluntary inspections collected by stewards through WISPA in 2017 was 97.7% in 2017. Of the 31,910 boats inspected by stewards, 8.6% (2,730 vessels) of participatory boats were found to be carrying invasive species—at which point stewards are able to inform boat owners to decontaminate their boats. This project was funded in part by a grant from the New York State Department of Environmental Conservation (NYDOE), Invasive Species Spread Prevention Grants Program through appropriations from the New York State Environmental Protection Fund, and the US Fish & Wildlife Service Great Lakes Restoration Initiative monies to the Finger Lakes-Lake Ontario Watershed Protection Alliance. For more on this topic visit these NYSG resource sites: www.nyseagrant.org/watercraftinspection and www.nyseagrant.org/ais. Recreational boating is a key pathway for aquatic invasive species spread; prevention is the most cost-effective way to manage AIS.